Over the last couple of months I’ve stayed a lot in hotels. Some trips have been for work and others for pleasure, but with so many nights spent between freshly laundered sheets dreaming of a pancake breakfast the following morning, it got me thinking about why staying in a lovely hotel is really so special. I’m lucky enough to get to experience some of the most luxurious and special locations as part of my job (I’ve stayed in the Rosewood London and Babington House in the last two weeks alone,) but I’ve also been making a concerted effort to book overnight stays and weekend getaways in my spare time too. My boyfriend and I have been breathing in the rustic Cotswold scenery while enjoying mini breaks at The Trout At Tadpole Bridge and The Fuzzy Duck in the last few weeks, simply just because; it doesn’t have to cost a fortune, but a night away from home can refresh the mind and provide something to look forward to during a dreary winter’s day. So if you need a little pick me up, or simply an excuse to wack out the credit card and book yourself an escape, here are the reasons I think staying in a luxury hotel is such a pleasure. We’re often so focused on getting from one day to the next, ticking off our to-do list as we go, that time just runs away from us; it’s hard to relax or take some time for ourselves, even when we’re supposedly chilling out at home. A night away in a hotel helps you leave those worries behind, while the change of scenery and really refresh the senses. 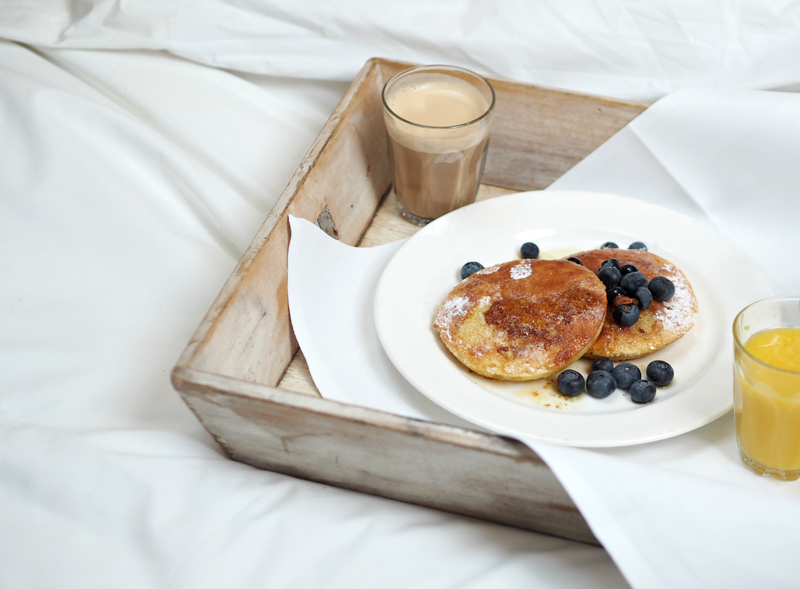 It’s such a simple pleasure, but I just can’t get enough of breakfast in bed – made my someone that’s not me! Starting the day off with a full belly of expertly crafted food and a steaming cup of coffee just puts a smile on my face and a spring in my step. Pancakes, eggs or croissants, it really doesn’t matter as long as it’s yummy. What is it about the little bottles of shampoo, shower gel and body lotion that are so exciting? Why are we always so desperate to take home the mini tubes of free toothpaste and even a packet of cotton wool buds? I love discovering what beauty freebies are lurking around the bathroom, even if I don’t intend to use them; you never know what new brand you’ll discover, or when that disposable toothbrush will come in handy. Although I have a bath at home and try to take some time out in the tub every week or two, the facilities in hotels are often incomparable. Giant freestanding bathtubs are my faves, not only because they’re super instagrammable, but because they make you feel like royalty. Slipping into the bubbles and sipping on a glass of something cold is the ultimate escape – even if for only fifteen minutes. Possibly my favourite thing about checking into a hotel room is falling immediately onto the bed and basically having a mid-afternoon nap. Often traveling is exhausting, but the call of a giant comfy hotel bed can help ease that lethargy and leave us feeling refreshed. The best bit about waking up in a hotel is undoubtedly being in a new location; the possibilities and opportunities to explore are endless, even if you’re only there for a day. Whether you want to go for a walk, find a cute cafe or go shopping in the town’s boutiques, it’s always a change from your usual routine. What are your favourite things about staying in hotels? Ahhh yes, I forgot the bonus benefit – not doing the cleaning or tidying up, so you can be as messy as you like! Oh you HAVE to get breakfast delivered! It's divine. You're so right – being stripped of responsibility of doing anything yourself is so good. And OMG the Rosewood is gorgeous; the rooms aren't as plush as you may think, but the rest of the hotel is stunning.